In recent months New York State has been the victim of horrendous flooding and devastation as the result of both Hurricane Irene and Tropical Storm Lee. The path of devastation is both wide and long – reaching from Maryland and New Jersey up to Vermont. Centuries of disaster records have fallen. We have seen the evacuation of major areas of New York City and entire towns cut off from contact with neighboring communities and the outside world. As news crews rush to film the spectacular scenes of water rushing through main streets as buildings rush toward certain destruction, there are other stories that are lost in the immediacy of the event. Two intertwining threads related to New York’s history are also part of the story. The disasters struck with such ferocity that many historic structures were either threatened or damaged. We have seen the loss of covered and other types of bridges that are rare and difficult to repair or replace. Historic structures of all types ranging from residential to business have been ruined by flood waters and related destructive forces. Some are well documented, but others were the everyday buildings that were often ignored by local photographers. All of these are part of the townscape that have now been affected and may not be able to be replaced. Into this situation come the local appointed historians. This is a network of over 1600 individuals representing every town, village, city, county and borough in New York State. Since 1919, the state requires that there is an historian whose responsibilities include documenting their respective communities and ensuring that the history of those areas are collected and preserved in proper repositories. It will be those historians who will assist the agencies and decision makers in finding the photographs, blueprints, maps, drawings and other items that will help reconstruct the buildings and structures. It will also be those historians who can help frame the scope of the disaster, to put it into perspective, to document its arrival and its departure, and to preserve the history of the moment for future generations. The second story is the losses of our history stored in what we thought were proper repositories. In many towns, villages and cities, historical materials are stored in the local historian’s possession. They may also be found in the local museum or historical society. All of these groups struggle for funds, membership and support. They do yeoman service with often little or no support from their local governments. Government is supposed to provide proper space for the storage of the materials deemed historic. But often the local appointed historian works from their home or inadequate space. 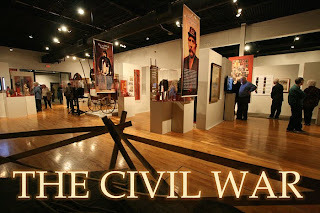 Local museums often have buildings, but items are kept in spaces away from the public. This usually means lower levels or rears of structures. In both of these situations, disaster is waiting to happen. This time the wait came to an end, and disaster struck. Historians in places like the Town of Rotterdam watched helplessly while decades of hard work floated away. The town’s written history was lost in a blink of an eye. 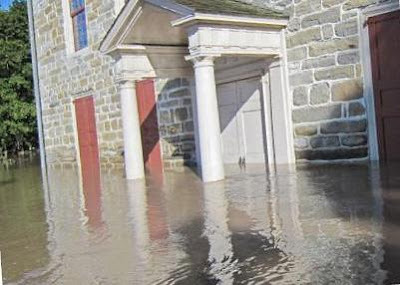 In the village of Owego, the Tioga County Historical Society’s officers and board members were unable to get into its facilities for three days as the flood waters rose five feet through the museum’s storage facility and research area which were located in the lower rear of the building. Work now continues on trying to salvage and restore what can be fixed, while many one-of-a-kind items cannot be saved. These scenes are being repeated throughout many parts of New York. No one is at fault, and yet everyone is at fault. Legislation determines that government should provide the space for the care of these collections, but there are no teeth in the law to punish those areas that do not. We ask historians not to work from their homes, but we need to strengthen our education of the reasons why this not a good idea, or how to run a proper office and to get your government to cover its cost. We look with dismay at museums and historical societies that store valuable collections in areas that are prone to flooding or destruction. Yet, we do not adequately support these facilities by either local funds or adequate visits from local residents, visitors or schools to provide the funds to create better facilities. We encourage facilities to scan or digitize their materials, yet in many cases those computer files are not stored off-site and are ruined along with the other historical materials. Perhaps these recent disasters can provide us with new opportunities to work together as an historical community. We are all in the business of saving and researching New York State history. Local appointed historians do not need to keep every piece of history, but should work with their local historical groups to ensure it is in a safe repository – be it museum, historical society, library or government office. Museums and historical societies need to recognize that collection care and disaster planning go hand in hand. Education about facility planning and working cooperatively with their local historian could go a long way in finding the answers (and there may be many correct answers) and implementing them. Governments need to see that sometimes the answers to the future are found in the past and in those who preserve that past. But most of all let us hope that our state is spared future disasters of the same scale so that we have the time to find those answers and make them work. Photo courtesy Old Fort Johnson. 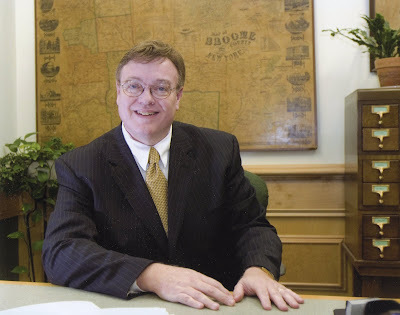 Gerald R. Smith is President of Association of Public Historians of New York State and Broome County Historian.